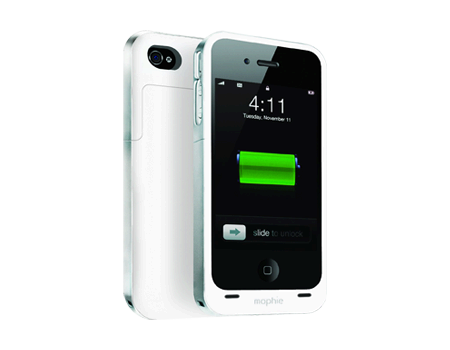 The mophie juice pack air is designed to virtually double the time you have to Rock, Talk, Surf and Send with your iPhone 4. Double your juice! Get everyday protection and all day power. This ultralight and thin charging case guards against everyday wear and tear and provides up to 100% extra battery power with the flip of a switch. The refined smooth finish makes for a comfortable fit in your hand and provides critical protection. When your battery runs low, just turn on the case to stay fully charged. And you can recharge both devices together with the included micro-USB cable so you always head out with two fully charged batteries.